Friday August 18 1911 Ida went this morning. I was up some earlier. Mother about the same. I got a lot of mail ready and slept some in afternoon Saturday August 19 1911 The day was spent as all others are Mother about the same. We heard from Ida she got there all right and baby is better. Sunday August 20 1911 We heard George & Flora Stevens have a girl baby. I slept late this morning. Will & George [Bremer?] called. Charles with Otts boys here for dinner Will took dinner at Woolfs was here first. 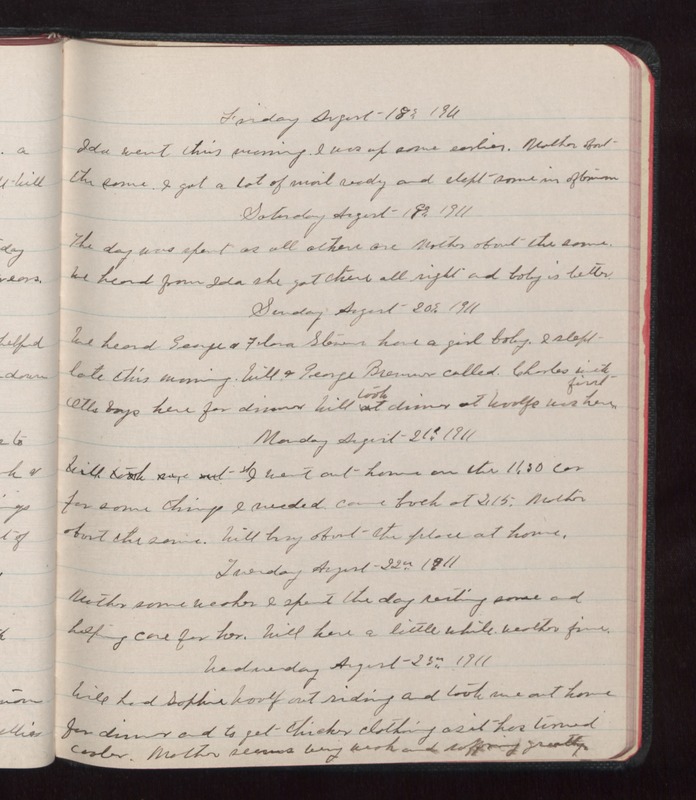 Monday August 21 1911 I went out home on the 11.30 car for some things I needed. came back at 2.15. Mother about the same. Will busy about the place at home. Tuesday August 22 1911 Mother some weaker I spent the day resting some and helping care for her. Will here a little while. Weather fine. Wednesday August 25 1911 Will had Sophie Woolf out riding and took me out home for dinner and to get thicker clothing as it has turned cooler. Mother seems very weak and suffering greatly.